US women open year with 5-1 win over Denmark. Sun., Jan. 21, 2018, 8:07 p.m.
SAN DIEGO – Mallory Pugh scored a pair of second-half goals, and the U.S. women’s national team opened the year with a 5-1 victory over Denmark on Sunday. 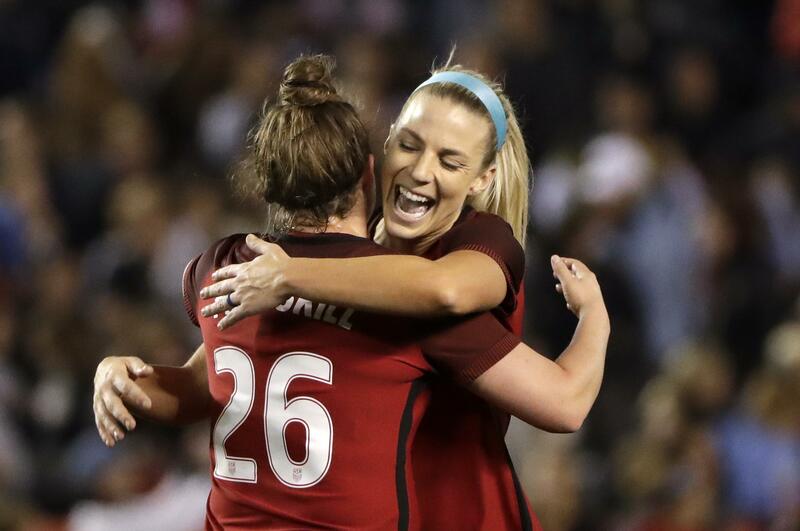 Alex Morgan, Julie Ertz and Crystal Dunn also scored for the top-ranked United States. The match was the first for a year that will include qualifying for the 2019 Women’s World Cup in France. The Americans are the defending champion of the sport’s premier event. Denmark went up 1-0 in the 14th minute off Nadia Nadim’s header. It was the 23rd international goal for Nadim, who played last season for the Portland Thorns in the National Women’s Soccer League. Morgan equalized in the 17th minute with her 81st international goal, seventh on the team’s all-time list. Ertz then scored in the 19th minute. While Ertz was playing for the U.S. women, husband Zach Ertz was playing for the Philadelphia Eagles in the NFC championship game. Pugh put the Americans up 3-1 in the 47th minute, and then scored her second in the 65th. Dunn added a goal in the 81st minute. U.S. Soccer honored former goalkeeper Hope Solo for her 200th cap before the match. Solo appeared in 202 games for the national team, most for any goalkeeper in U.S. history. She had a record 101 shutouts and an overall average of 0.54 goals allowed. Solo took part in three World Cups and three Olympics for the national team. But the 2016 Olympics was the last time she played for the team. She was suspended following a quarterfinal loss to Sweden and did not play for the United States in 2017. Solo has recently declared her candidacy for U.S. Soccer President to succeed Sunil Gulati. Gulati said he would not seek another term in the wake of the U.S. men’s failure to qualify for this year’s World Cup in Russia. Solo is among eight candidates for the post. The match capped January training camp. But the team was missing a number of regulars because of injuries. Tobin Heath had minor ankle surgery earlier this month that was expected to keep her out for up to 12 weeks. Heath, who also plays for the Thorns, injured her ankle in the NWSL title match between the Thorns and the North Carolina Courage in October. Portland won 1-0 for its second overall league title. Midfielder Morgan Brian, who is playing in France with Lyon, stayed out of January camp because of nagging injuries, while defender Becky Sauerbrunn has a stress reaction in her left foot that necessitates several weeks of rest. Additionally, Samantha Mewis (knee) and Rose Lavelle (hamstring) didn’t take part in camp. Published: Jan. 21, 2018, 8:07 p.m.